Effective In Reducing Vane, Piston & Gear Pump Wear And So Recommended For Use In Hydraulic Systems, Enclosed Gear Box, Chain Drives, Compressors, Vacuum Pumps, Mining Machinery, Machine Tools, Oil Circulating Systems. Vane, Piston & Gear Pump Wear And So Recommended For Use In Hydraulic Systems, Enclosed Gear Box, Chain Drives, Compressors, Vacuum Pumps, Mining Machinery, Machine Tools, Oil Circulating Systems. all heavy duty enclosed gear drives with circulation or splash Lubrication system operating under heavy and shock load condition up to 100 °C. For General Purpose Lubrication Of Textile Machinery Paper Mills And Machine Tools. For Lubrication Of Steam, Gas And Hydraulic Turbines, Cylinder And Bearing Of Multistage Compressors, Torque Converters Etc. For General vacuum pumps, High vacuum diffusion pumps. For lubrication of special purpose lubrication of moving machine parts, planners, shapers, grinders, horizontal boring, jig borers machines etc. For Open Gears Working Under Heavy And Shock Load At Varying Temperature Conditions and can also applied with brush, swab, paddle or spray. For Lubrication Of Textile And Machine Tool Spindle Bearing, Timing Gears, Centrifugal Separators, Positive Displacement Blowers And Hydraulic Systems Of High Precision Machine Tools. Used In Close Circulating Heating System in Textile, Pharmaceutical and Many Other Processing Industries. Used For Lubricating Medium-Speed Trunk Piston Medium-Speed Diesel Engine Found On Ships, Coastal Vessel, Tugboats As Well As Land-Based Stationary Power – Generation Equipment (DG Sets). Used in Calendar Bearings in Paper Industry and Sugar Mill Roller Bearing and Are Also Recommended For Lubrication of Worm Gears. Recommended for the lubrication of sugar mill bearings and crown gears, partly open worm gears in heavy industries. MOTOROL Hicut 14 use in machining all non ferrous metals except Titanium, MOTOROL Hicut 21 recommended for machining operation in ferrous materials like mild steel, carbon steel, manganese steel, nickel, steel copper, aluminum and their alloys, MOTOROL Hicut 23 capstan and turret Lathe, MOTOROL Hicut 55 recommended for severe machining operation like broaching, gear cutting grinding and cutting. Meets IS: 3065-1985 Type 2 grade III and U.K. Defence DEF STAN 91-26/issue 1 for Oil ZX-6 specifications. Recommended in turning, drilling, grinding boring and milling operation of ferrous and non-ferrous metals. Complete protection from rust and corrosion. Used inaluminium and brass wire drawing. For various types of rock drills, jack hammers, wagon drills, hippers, pavement breakers etc. For lubricating medium-speed truck piston medium-speed diesel engine found on ships, coastal vessel, tugboats as well as land-based stationary power-generation equipment (DG Sets). 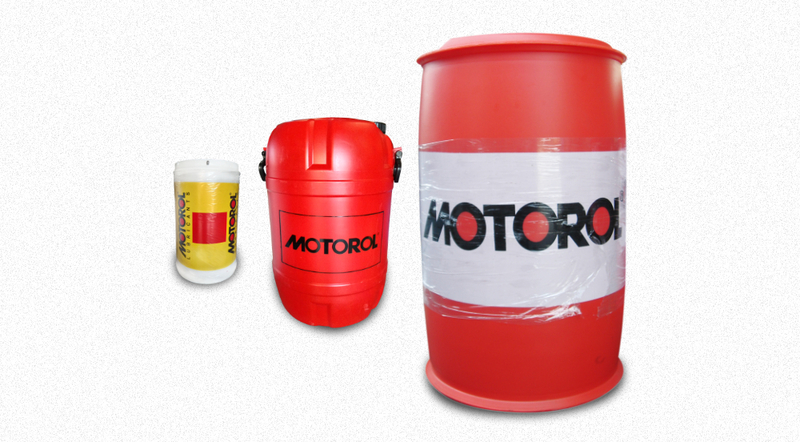 MOTOROL HYDROFLUID 001 is a special product manufactured from low pour point and high viscosity index base oil with low moisture and good di-electric strength. It is used in 132 KV switchgear Circuit Breakers. Conforming to IS: 335-1993 with latest amendments. For manufacturing tyres, mats, foot wear, moulded and extruded goods. Extruded & Moulded Articles, LPG & Automotive tubes. VULCAN P 32 : butyl and ethylene propylene rubbers and also in light colour rubbers, VULCAN 250 : conveyor belt, butyl tubes & EPDM. For Bearings Of Electric Motors, Pumps And Compressors, Gears, Chains And Sliding Surfaces Of Machines In Steel And Paper Mills.